From Vernal at Hwy. 40 ride North on Hwy. 191 for 35 miles. At the junction of Hwy. 191 and Hwy. 44 turn right and continue East on 191 for 6 miles to the Flaming Gorge Dam. 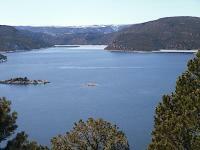 From Flaming Gorge Dam return west to the junction of Hwy 44 and Hwy 191. Turn right on Hwy 44 and continue North for 28 Miles to Manila. Route starts in Dinosaur land Utah and follows amazing red stone geological formations with roadside signs indicating which fossils and minerals are found where. You then travel over the top of the Uintah mountain range winding through everything from aspen trees to ponderosa pines. Several designated scenic overlooks as well as countless points of interest follow. Amazing views of Ashley valley from the south slope. The view from the Flaming gorge dam is great. The red canyon overlook is second to none with trails around the canyon rim overlooking Flaming Gorge Reservoir several hundred feet below. The North slope offers more great panoramic views and a great overlook site where you can see for miles. Wildlife is abundant(elk, mule deer, big horn sheep). Road condition is excellent. Everything from steep tight mountain side switch backs to long rolling straits. Can be cold especially at higher elevations in the spring and fall. Plenty of places to stop and soak in the views. Many campgrounds and roadside forest service restrooms. There are visitor centers at both Flaming Gorge dam and Red Canyon. Tours are also available of the dam. There are a few restaurants in Manila, one in Dutch John, and one at Red Canyon. on May 1, 2010 2 out of 2 members found this review useful. As I stated in a previous post, you do not want to skip the Flaming Gorge Dam. It's worth the stop along the route. on February 22, 2016 1 out of 1 members found this review useful. Road 191 from Vernal UT, to Rock Springs WY, then to Green River WY, and down 530 to Manila UT. Camped just off 44 outside Manila. Get to a see lot of different landscape. Hills, flat open spaces, twists and turns. Just a nice over night ride in August. Take warm sleeping bag if staying outside. Would like to go back to Manila to see Ute Mountian Fire lookout post that's been restored.